“Yes!” was my immediate, no-hesitation reply when asked if I would like to go skiing with Homewood Snowcat Adventures. 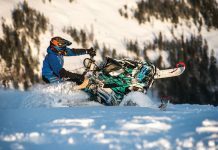 HSA has been in the works for a few years, and finally, with a consistent snowpack, skiers and riders can now easily access more than 750 acres of Homewood’s back-country terrain, where before it was only public access by snowmobile or human power. Megan Michelson and guide Alycia Glines survey the terrain from the top of Upper Bowl. With this being their inaugural year, I couldn’t wait to check it out myself. Cat skiing is one of the most coveted forms of skiing, next to heli skiing, of course, and I wasn’t going to miss an opportunity to check out Homewood’s back-country terrain with a ride up the hill and some fresh legs. Myself, along with photographer Matt Bansak and Tahoe Weekly’s Jenn Sheridan arrived at Homewood’s North Lodge on a blustery, snowy morning anxious for our adventure to begin. With more than a foot of new snow overnight at lake level, it was going to be deep on the mountain. I had visions of perfect powder turns all day long and was excited to get my day started. The drive to Homewood (with near whiteout conditions at times) was exciting, too, and we wondered if they would operate the cat with the high winds and low visibility. By 8:30 a.m. our speculations about the weather had proven true, and HSA made the decision to reschedule our trip due to high winds, low visibility, heavy snow and dangerous snowpack. We would hope for an afternoon window, but in the meantime, we would ski. 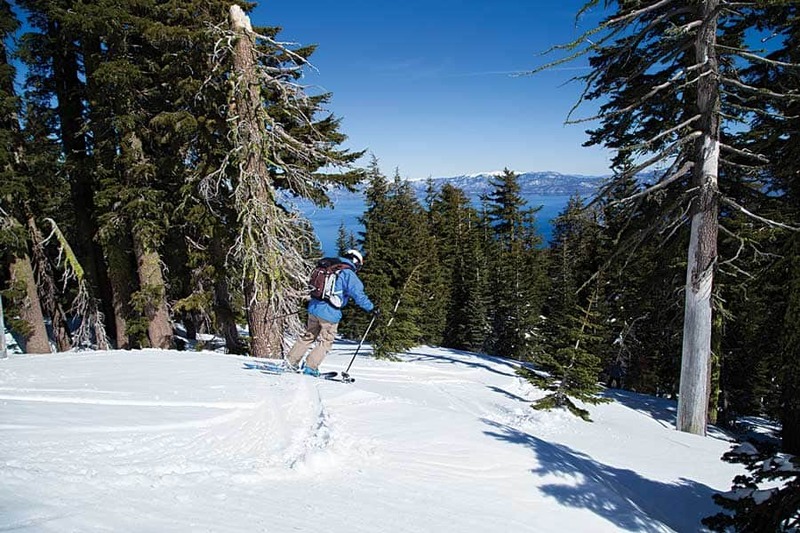 One of the beautiful things about Homewood Mountain Resort is that when the weather is too gnarly for cat skiing (or for the lifts to turn at other resorts), the in-bounds terrain offers plenty of safe, low-angle slopes protected from wind for getting your pow fix. This was one of those days. Madden lift finally opened at 10 a.m. and we skied deep, soft powder turns all day long as the storm settled in for a second round. The cat would have to wait. Take two. Bluebird. Finally, I couldn’t wait to step foot in the cat and start exploring the rolling terrain above the resort. Game on. Four days after the storm with the weather warming we wondered what type of snow conditions we might encounter as Bansak and I headed back to Homewood for our rescheduled tour. The morning seems casual compared with the high-energy of the storm only days before. We prepare with layers and sunblock for a classic spring-like Sierra day. Smiles all around. We are about to go cat skiing after all. We meet our group and guides outside at the little red school house at 8:30 a.m. Alycia “Fish” Glines and Laura La Plante were to be our guides for the day, along with guide-in-training Rick Raduziner. 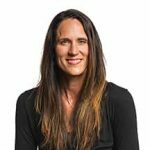 Glines discusses snow safety, snow quality, weather, back-country etiquette and outlines what our day might look like. Fun, mostly. HSA is a fully guided back-country experience and back-country gear is required – beacons, probes, shovels and packs. It is provided for you if you don’t have your own. 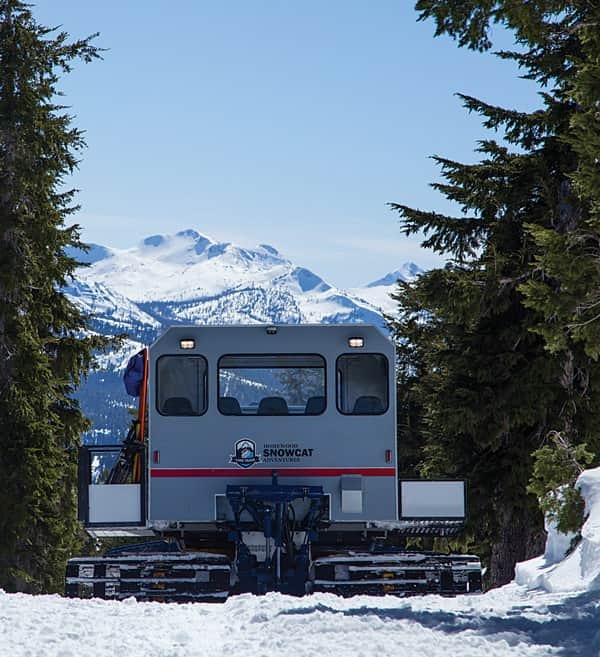 A day with Homewood Snowcat Adventures is a great introduction to the back country, without all the work. They offer a wide variety of terrain from glades to open bowls, low-angle cruising to steep chutes. 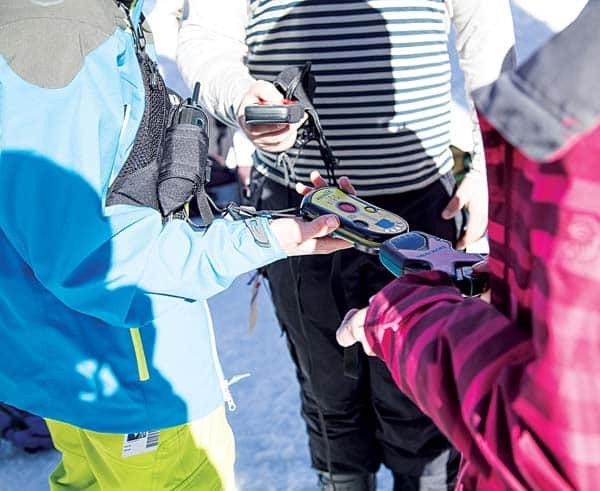 The guides decide what to ski based on weather and the abilities of the group. Newbies can get acquainted with the gear, get a taste of snow safety and route picking and how to make decisions with a group. 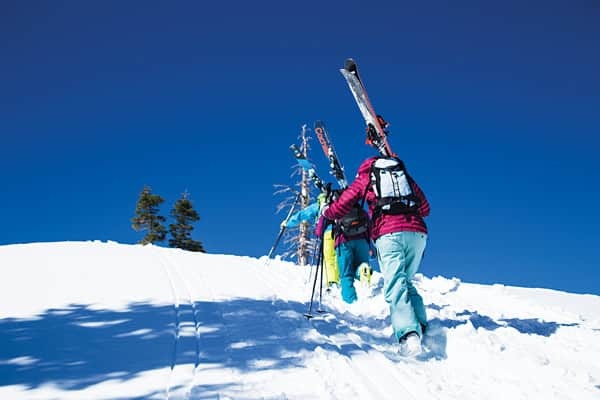 If you are already familiar with back-country skiing, just sit back and enjoy the ride. With a full cat, we head out from the top of the Old Homewood Express, winding through a tight forest, finally skirting around a steep slope to arrive on a ridge just below the summit of Ellis Peak at 8,700’. Steve Smith expertly maneuvers the snowcat, of his own custom design, within inches of trees. Homewood is known for it’s view of Lake Tahoe, and the view that greets us as we exit the cat does not disappoint. The lake sparkling blue beneath the blue of the sky, with a fresh coating of fluffy white just waiting for us. It never gets old. 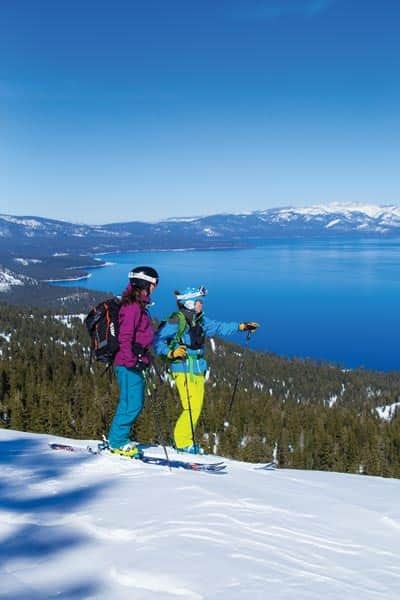 Ellis Peak offers the most amazing 360-degree views of Lake Tahoe, Desolation Wilderness, Granite Chief Wilderness and Twin Peaks. It’s easy to stay and soak it up, but the lure of powder below calls. Glinen leads the way setting the left rail and we drop in one by one heading for the Garden of Eden and Richards Bowl. We weave through low-angle glades of old-growth hemlock forest, which opens up into widely spaced trees and a bowl below. Even with the warm weather, the north-facing slopes hold perfect, creamy, boot-deep powder turns. Another spectacular run has us traversing through trees laden with snow to reach Upper Bowl. A quick hike and we crest the most amazing view of the day, to stand atop a wide open, double-benched bowl. Not one track. We all look at the snow pack, assess trigger points, and Glines talks about safe routes if the bowl were to slide. Chances of it sliding are slim. But if it did go, it would go big. We would ski the tree line on the right to be safe. Wide, open turns on two steep pitches and it’s off to meet the cat for another run. Photos by Matt Bansak. For more information, visit skihomewood.com. 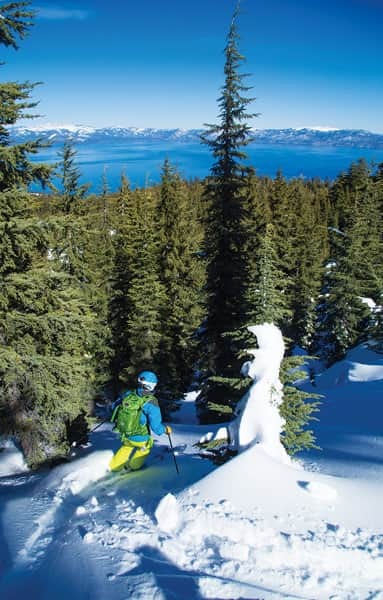 To book a reservation, e-mail sales@skihomewood.com.